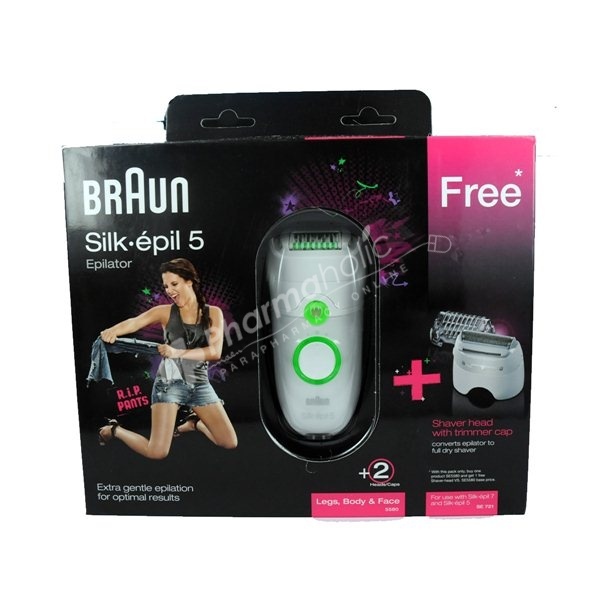 Designed for efficient, long-lasting and extra gentle hair removal, the new Silk-épil 5 is ideal for women who are new to epilation. It includes Close-grip technology with 40 tweezers that even remove short and fine hair. It also has a comfort system with massage rollers that stimulate the skin, plus a cooling glove to soothe after epilation. Designed for efficient, long-lasting and extra gentle hair removal, the new Silk-épil 5 is ideal for women who are new to epilation. It includes Close-grip technology with 40 tweezers that even remove short and fine hair. It also has a comfort system with massage rollers that stimulate the skin, plus a cooling glove to soothe after epilation. High frequency massage: The high frequency massage system stimulates the skin and effectively soothes the plucking sensation during epilation to maximize your skin comfort. Cooling glove: The cooling glove effectively cools the skin before and soothes it after epilation to further increase your comfort. Close-grip technology: The 40 tweezers have been engineered to close at the optimal angle and grip hair even closer to the skin for better removal of even the shortest hairs (0.5mm). Pivoting head: Better adaptation to the contours of the body for more comfort and maximum thoroughness. SoftLift Tips: Effectively lift even flat-lying hair and help guide them to the tweezers for removal. Smartlight: Helps easily guide your way through the epilation process and lightens up even the finest hairs for no miss removal. Waterproof & washable: Thanks to a sealed body, they can be both used and cleaned under running water. Speed personalization: Select the right speed for your individual needs: Speed 1 for extra gentle epilation, speed 2 for extra efficient epilation. Shaver head: Allows you to use your epilator as a full-fledged dry shaver. Trimmer cap: To trim hair in sensitive areas. Sensitive area head or cap: Perfectly fits to underarms and bikini area. Facial head or cap: To remove unwanted facial hair. Efficiency cap: Ensures maximum skin contact for faster epilation.